Kham » September 26th, 2018, 6:27 am wrote: That triangular mark on the lunar surface about 4 o’clock on the foot pad looks very feminine to me. And what is the deal with that black (complex) shadow formation – about 2 o’clock? Sorry, please. That triangle is a veritable smoking gun, flagrante delicto. Keen eye! Kham » September 26th, 2018, 12:27 am wrote: That triangular mark on the lunar surface about 4 o’clock on the foot pad looks very feminine to me. Okay, that is so EWW. . . but I have to agree with you. I shudder at the thought of these creeps. The image was absurd enough without such a thing. But I guess the Mind Screw is the voyage, so we shouldn’t be surprised in the slightest. I was looking at this image and I found a clown face staring at me. On inspecting the YT video, it is presented as 'updated' by someone, including the ESA and other logos. They don't feature in the original film. Oh dear. I apologize. Admins - Please feel free to remove this nonsense from me. Interesting find. I have been analyzing pictures from the military media, fields of speculation called science and industrial health for evidence of fakery but seem to have neglected the fact that these same pictures contain images specifically designed for psychological manipulation. “They have left mistakes in these images by accident, what a sloppy bunch of work”. Is this the case? If the stakeholder charged with carrying out a specific campaign goes to trouble of including subliminal images in associated pictures, quite an intricate task mind you, then one must consider that ‘mistakes’ as well as the subliminals are intended. Have long thought that pictures should be analyzed for their psychological impact. As we reach the 50th anniversary of the Great Moon Landing Hoax, we should expect copious amounts of silliness oozing into our TV sets and computer screens - courtesy of the media outlets owned by what I like to call the "Nutwork" (i.e. the international network of nutty psychopaths that hope to keep ruling this world - using the "art" of deception). Well, what are we to do - other than wish the Nutwork good luck - since their stories are getting ever sillier. And, their fake landing failed. Drama . . . This is embarrassingly bad, low-budget theater. patrix » April 12th, 2019, 6:46 am wrote: This is embarrassingly bad, low-budget theater. Mind you, it is truly mind-boggling to behold the utter crassness of their multi-million $ space deceptions sold to this world's inhabitants. "JERUSALEM: An Israeli spacecraft on its maiden mission to the moon has sent its first selfie back to Earth, mission chiefs said on Tuesday." 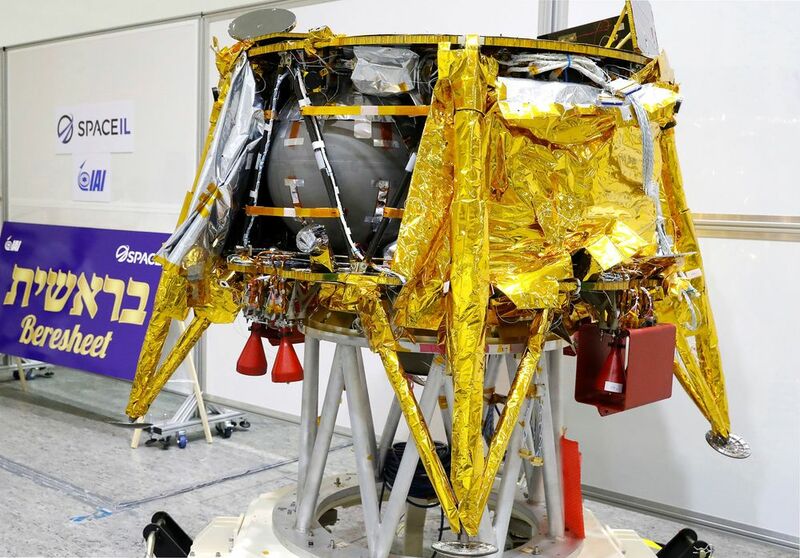 "Moon Landing by Israel’s Beresheet Spacecraft Appears to End in Crash. The spacecraft’s orbit of the moon was a first for a private effort, but the landing failure highlighted the risks of fast and cheap approaches to space exploration." Fast and cheap is bad, folks - get the message? We need to spend more! Come on, open your wallets for the exciting space race, you stingy taxpayers! Fortunately, it seems that we "tinfoil hatters" are growing exponentially in numbers. This forum's members can be proud for having strongly contributed, in this last decade, to expose NASA (et al) for the formidable fraud that it is - and one that keeps dumbing down humanity as a whole. Accordingly, the Nutwork is switching into panic mode - and are now frantically pumping up & multiplying their "space race" stories for public consumption. Their "shrewd" tactic of associating "tinfoil hatters" (who reject these ongoing spacetravel deceptions) to Flat Earth proponents appears to have ultimately fallen flat on its face. Let us patiently keep pouncing at the Nutwork's inane space propaganda - for the betterment of human kind. I am confident that we shall live to see the day when they will come down - with a (Big) bang. I see that too Simon, and we need a new enlightenment badly. The lies have been piling up exponentially the last century. A nice structural analysis of the Moon Lander. Notice though that the presenter is having a religious talk at the end and that he seems to sympathize with Flat Earth. The FE DBA campaign is still going strong, but they try to keep it subtle. A comment I heard regarding that the Lander seems to be made of cardboard, coat hangers and tape is that new space crafts look that way too. So that may have been a purpose with this new hoax, since those crafts seem to have been made by a child as well. Thank you Simon and Patrix for posting this here. I’ve been too busy to even scan the “news,” so you might imagine my expression when I saw that horrifically bungled lunar-garbage play-house looking thing. Ugh! I must agree with Patrix’s point about them trying to make the old trash look decent—at least by comparison. That was the first thing that came to my mind anyway. 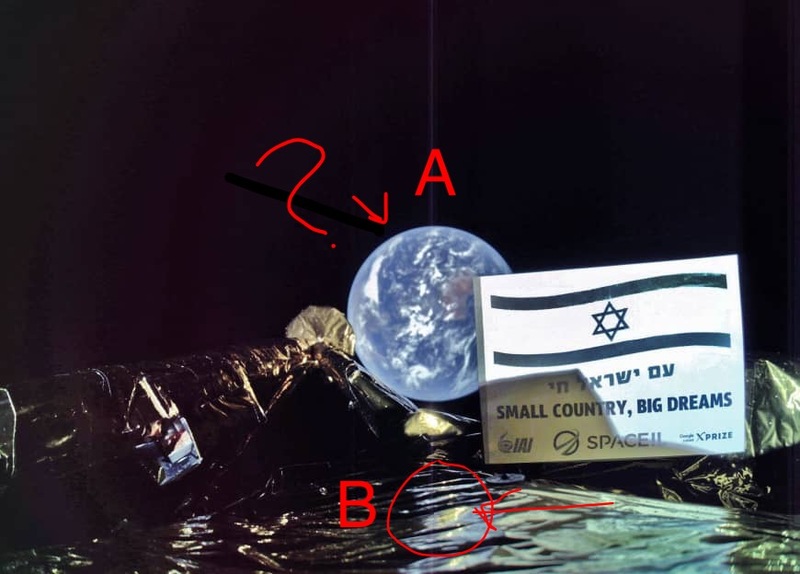 So, I am guessing that this (“B”—above) is supposed to be a reflection of earth (“A”—above)? Sheesh. One would think they might (at least try to) mirror the image of earth as it is displayed. This is more badly botched than usual . . . and that’s saying something. Yes. once you start to look for it, it becomes obvious Dear SCS. But if we're incapable of asking the question - Has global media always been a centrally controlled propaganda machine that lies about practically everything? It's not possible to answer it. And that's the way it still is for most people. Another video I came across - Armstrong=Gagarin? Is this another Simon/Cluesforum first as NASA meaning in Hebrew was? 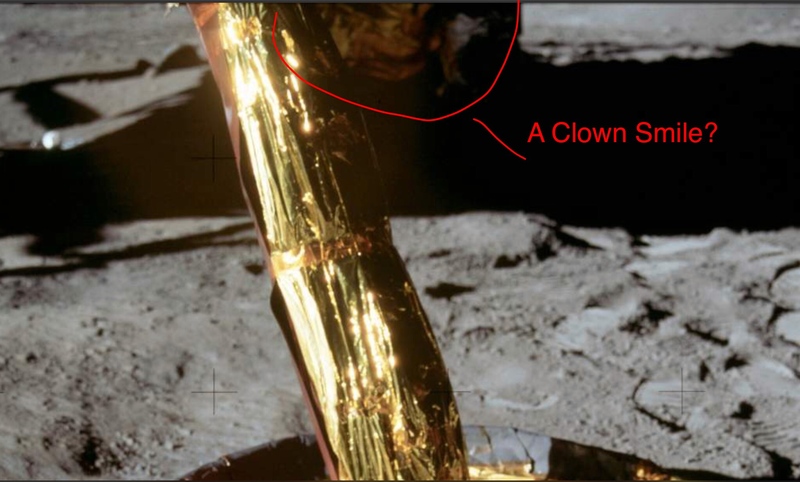 As we reach the 50th anniversary of the Great Moon Landing Hoax, we should expect copious amounts of silliness oozing into our TV sets and computer screens - courtesy of the media outlets owned by what I like to call the "Nutwork"
Indeed. And flooded the internet is with new schemes to promote the relative ease of blasting up into the heavens. When I click, 'Google' on my Samsung smart phone there is a tab called 'Discover' which then gives you stories selected by Google for your delictation. I started to notce how space heavy those selections are. It seems everybody is at it these days. Israel (crash landing), India shooting down a Satellite, Trump developing a space army, a new cold war, Space X as a constant and another perhaps 8 other private companies all vying for massive contracts and hoping to share NASA launch pads! In fact, it's easy these days! The only people struggling are the Americans who have targeted 2024 as the next point at which they will be able to perform a moon landing! The main problem for them sadly is cash. They just don't have enough! Forget the intervening 50 years of development, it's just too expensive for the country whom own 25% of global resources off of the back of 3 to 4% of the worlds population! Just can't quite afford it. As somebody else remarked.....keep shaking those charity tins. Come on tax payers. Don't you want another uplifting feel good drama to crow about and embolden the exceptionalism of the USA? One of the comments on this thread suggest that more and more people are waking up to it. Sadly, I disagree with this concept and feel the author might have fallen prey to confirmation bias. We surround ourselves with people willing and able to think. As a personal aside, I never foresaw Brexit happening as I knew nobody who voted or would be willing to vote for it. Similarly, you'll not meet a cluesforum member who believes entirely (maybe even partially) in space related tales! On this point, I have honestly never heard anybody voluntarily suggest that a) there are elements of the media that might be a sham or questionable or b) any elements of the space related stories coming out of the media to be questionable. Or.....at the very best you will hear people crudely articulate some kind of worry, but then quickly snap out of it for fear of sounding like a 'conspiracist'. Oh on that note, British people or viewers of the BBC might have noticed the tremendous resurgence of the linking of conspiracy to anti-semitism. I do like to support my statements with articles, but there are simply too many. The enveloping and shaping of minds in this respect of left leaning politics and anti-antisemitism and conspiracy is almost complete. The BBC is of course not alone in this. It is a global media effort. Any day on which there is no BBC story of antisemitism in the labour party or the world, you will find it in other outlets. This ensures everybody is touched. Antisemitism was even linked to the yellow vest protest 'movement' in France as were the consiracists! As remarked on this thread, the Israeli imagery supporting their alleged attempt are utterly ridiculous and yet? Nothing. Not a whisper anywhere of foul play. The more space related stories you have help to cement the idea that it is simple and can be done forges the idea that it is easy. Forget any of the awkward practicalities such as the complete impossibility of NASA ever sharing a launch pad with anybody, let alone a variety of billionaires getting involved with a retail background! No problem. Cash is all you need. This deluge of stories from 'competing' countries helps to envelop us in a propaganda dome, identical to that of Truman Burbank. You cannot see the wood for the trees. This drive seems perfect to promote a massive media accomplishment of a studio based 'real' moon landing by 2024. When it happens there will be no questioning because launching bits of metal have now become common place. Space X is now being 'rivaled' by none other than the Amazons founder and a range of other private enterprises! Israeli imagery is seem for a day and then submerged in new layers the very next day giving nobody any time to sit and ponder them. This strategy with Trump worked beautifully with his early bold lies that were run by the media. None were ever really examined. There was no time! Meanwhile, longer running dramas such as the Trump Russia election funding abruptly came to an end with the Mueller report with equally no public remarks! Two years of speculation and no case to answer! Brexit rumbles on as a triumph for the medias slick operation with thousands of stories and yet nobody has a clue as to 'what is going on'. Soon the stories will be of, 'Space too full' or 'Earth's atmosphere reaches crisis point' or 'Satellites hitting one another'. There are really no limits to how far these stories can go. When you write the script, you can take it anywhere you want. You can see that space as a whole will be a new frontier for fear based propaganda or a new 'theatre' for news 'stories'. Trump with his space fleet and India shooting down a satellite have teed that up nicely. Funnily, those countries involved in the space drama gives clues as to which nations are closest to one another. Each country only being allowed to 'enter the space realm' once they have made inextricable ties and sworn allegiance to the propaganda flag. This would paint Russia and the USA as indeed two of the closest countries on the planet in total contradiction to their Punch and Judy portrayal since the dawn of TV and before. Forgive me, but I can't wait for 2024. I cannot wait to see what half a decade of planning will bring in terms of new media techniques, CGI, augmented reality and with a large helping of bias of omission thrown in too! It's going to be a feast for the eyes. As much as most of what NASA does is fake, its budget is real for sure. Maybe its just a giant fund diversion scheme, and they must have something to show for the money, which goes to some other purposes, with the added bonus of the propaganda and voter uplift. There is some similarity but in my opinion Armstrong and Gagarin are not the same person: I can easily tell the two apart (Gagarin has a definite Slavic look, Armstrong has an Anglo look). Contrast this with some of the Challenger crew doppelgangers where, from my perspective, the resemblance is just too great to plausibly be coincidental.